It's Chust... - Ramblings of Mad Shutterbug & the Border Collie Bros. Tempted to make this one another of the 'Tell me the story in this photo' posts. So, feel free, if you want to toss that into the comments as well. In other news, Houdini is very glad that I'm home from work, as there is Thunder about. In other, other news, I could wonder why I feel so tired as it's only Tuesday, except hey, only one day off this past weekend making this the eight day in almost a row, and eight out of nine working. Joy. Not going to Camera Club this evening because of weather and tired. I, for one, am enjoying this. Dragon cave! Dragon cave! Dragon cave! I'm thinking that they've come across something large, scary, and somehow faintly ridiculous in a very unexpected place; like a giant deep-sea squid having a swim in the bathtub, or a particularly large and scaly crocodile napping in the bed. Also, I'm not buying them in a fantasy setting because their body language doesn't really go with their facial expressions. They're not really scared...from the necks down,they're just hanging out. So I agree with Aineotter that they're torn between horror and amusement, like when I discover the kitten has turned on the faucet in the bathroom and left it on all night (which she did yesterday. Gotta love uber-modern apartments where all appliances, doors, and cabinets have sleek handles that need just to be whacked). I like this. 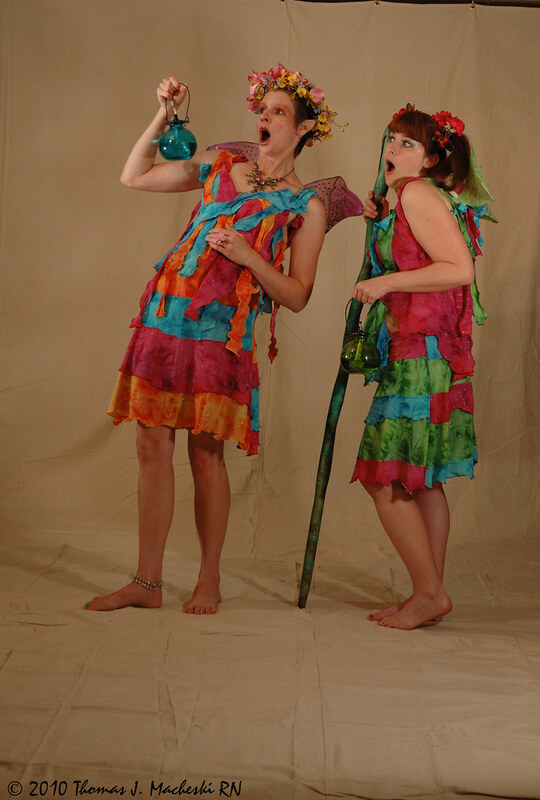 I just don't know if I can take these fairies seriously in a standard fantasy setting. But I can see them working with humor or unexpected contrasts. I am not convinced that they are afraid of anything, they are singing in an opera and should be on a stage. I like the idea above from aineotter to place the tiny fae in a big people-house discovering something "amazing"!